Ottawa and Arnprior were among the latest cities targeted by rotating strikes by the Canadian Union of Postal Workers (CUPW), leading to a halt Wednesday morning in the delivery of mail and packages by Canada Post. Ottawa and Arnprior were among the latest municipalities targeted by rotating strikes by the Canadian Union of Postal Workers (CUPW), halting delivery of mail and packages by Canada Post employees Wednesday. As of 6 a.m., a picket line of roughly 70 workers had already appeared at Canada Post's mail processing plant on Sandford Fleming Avenue near the corner of Industrial Avenue and Riverside Drive in Ottawa. "We're trying to keep everyone out, including management. Everything is closed. Nothing is going out today," said Ian Anderson, president of the CUPW local. Anderson said all Ottawa-area CUPW members, including mail carriers and workers at various outlets across the city, are participating in the walkout. CUPW reported members with the Arnprior-Renfrew local also joined the walkout Wednesday morning. CUPW's 50,000 members have been holding walkouts across the country for the past two weeks in an effort to pressure the federal government after negotiators failed to reach an agreement on Oct. 22. While the walkouts have generally lasted 24 hours, Anderson wouldn't say how long the Ottawa strike will last, but said local members were happy to participate. "Everybody was happy. It's about time. We need to show management that we've had enough," Anderson said. "We're a public service. We're here for the public, and the public needs to know how Canada Post is treating its employees." 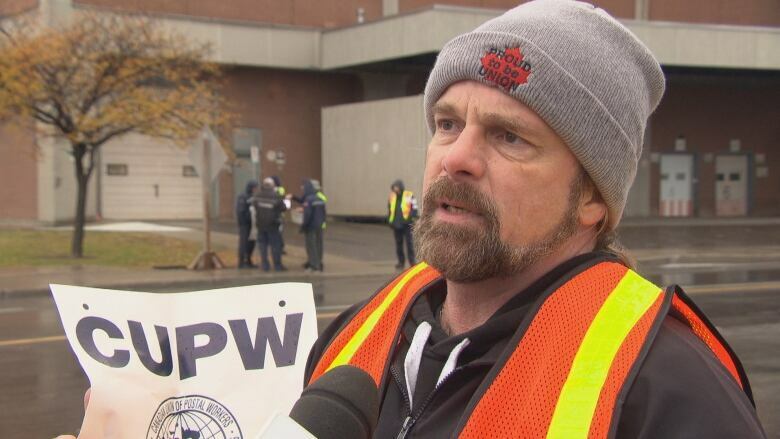 The Ottawa pickets were joined by CUPW's national president Mike Palecek, who had a message for Canadians and businesses affected by mail delivery delays. "We're trying to get management to move. Negotiations haven't been fruitful. We haven't seen a willingness to address any of our fundamental issues," Palecek said. "We're frustrated, too. Postal workers are the biggest defenders of the postal service. This isn't where we want to be." The union is seeking a four-year deal with an annual wage increase of 3.5 per cent. But Palecek said wages are not CUPW's top priority. "We have a health and safety crisis at Canada Post. We've seen injury rates skyrocket. This has got to be fixed," he said. CUPW also wants Canada Post to address what the union describes as inequality for rural and suburban mail carriers compared to their urban colleagues. In a written release, Canada Post stated it remains committed to reaching a negotiated settlement, while at the same time making every effort to minimize the impact of any disruption on the customers it serves. Palecek didn't rule out an escalation in the job action if negotiators don't start making significant progress, though he wouldn't specify what form that might take. "We'll see. If Canada Post doesn't come to the table and negotiate, we may have to do something else. We're not there yet," he said. While Wednesday's job action saw the union's locals in Ottawa and Arnprior-Renfrew join the job action, other locals in eastern Ontario ended their walkout, leading to the return of mail delivery in Smiths Falls, Petawawa and Deep River.